European Union countries have reached an agreement on how to regulate Russia's Nord Stream 2 pipeline, Chancellor Angela Merkel said on Friday, declining to give details on the compromise. "Regarding the gas directive, we have reached an agreement and this was possible because Germany and France worked closely together," Merkel told a joint news conference with Malian President Ibrahim Boubacar Keita. According to a draft deal obtained by French Press Agency (AFP), France and Germany have now agreed to oversight from the "territory and territorial sea of the member state where the first interconnection point is located." The pipeline is due to emerge at the German Baltic port of Greifswald, from where gas will be distributed to other EU countries. The draft text replaces the older wording stating the EU rules on gas imports will be applied by "the territory of the member states" and or the "territorial sea of the member states." The draft compromise was submitted to a meeting of the EU ambassadors discussing a revision of gas market rules for the 28-nation bloc, diplomats said. The ambassadors were due to wrap up the talks on the gas rules later Friday afternoon, they added. But the European Parliament and EU member countries meeting at a higher level must still sign off on the gas market reforms. France's earlier support for giving EU countries more say in the pipeline project appeared likely to shift the balance away from Germany. 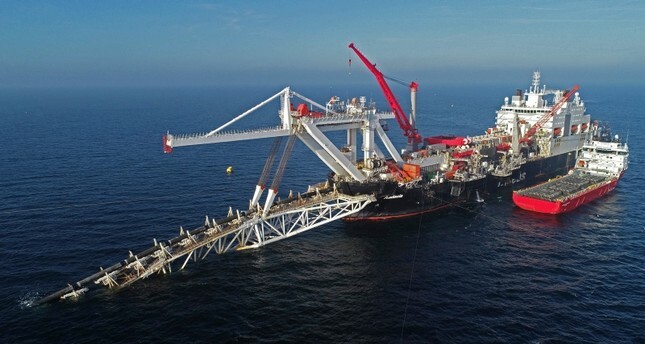 Nord Stream 2 faces opposition from many countries in eastern and central Europe, the United States and particularly Ukraine because it risks increasing Europe's dependence on Russian natural gas. Combined with the planned TurkStream pipeline across the Black Sea, Nord Stream 2 would mean Russia could bypass Ukraine in providing gas to Europe, robbing Moscow's new foe of transit fees and a major strategic asset. Kremlin spokesman Dmitry Peskov said in Moscow that Washington was spearheading efforts to undermine fair competition. "This international project is necessary for Russia and the EU, but it is constantly attacked by third countries, more specifically by the United States," Peskov said. Peskov accused Washington of "underhanded competition" by trying to encourage Europeans "to buy more expensive American gas." Saying Russia will "follow developments very closely," Peskov added: "We hope that the EU member countries will know how to settle this issue themselves." In earlier supporting broader EU oversight, a French diplomatic source had told AFP on Thursday that Paris was "not for or against Nord Stream 2". But the source said France sought "guarantees for the security of Europe and for the security and stability of Ukraine." The draft compromise sought to tackle concerns over Ukraine saying: "We consider a (gas rules) directive in this spirit indispensable for a fruitful discussion on the future gas transit through Ukraine." German Chancellor Angela Merkel has so far insisted that the pipeline is a "purely economic project" that will ensure cheaper, more reliable gas supplies. She has said there will be no dependence on Russia if Europe diversifies at the same time. Construction has already begun, involving companies such as Germany's Wintershall and Uniper, Dutch-British Shell, France's Engie and Austria's OMV. Gas is due to start arriving in Germany by the end of the year.